Discovered chemosynthesis – an entirely new mode of life, in which the energy to build organic molecules comes from chemical reactions rather than from sunlight in the more familiar photosynthesis. Discovered and isolated nitrogen fixing bacteria in soil that make nitrates available to green plants. Founded microbial ecology, where the interactions of microbes in cycles with their natural environments are studied holistically. Sergei Nikolaievich Winogradsky was born on September 1, 1856 in Kiev, which was then in the Russian Empire and is now Ukraine’s capital city. His family were wealthy landowners and his father, Nikolai Konstantinovitch Winogradsky, was the head of a bank. His mother’s name was Natalia Viktorovna Skoropadskaia. Winogradsky received the education a wealthy boy could expect in those days, so the classics – Greek and Latin – were considered much more important that the sciences. Winogradsky was deeply unhappy at school, because he did not enjoy the classics – indeed he hated every minute of being forced to learn the ancient languages. Despite his dislike of the curriculum, he graduated from high school at the top of his class with a gold medal. At age 17 he began a law degree at the University of Kiev. It did not take long for him to decide law was just as boring as the classics, so he switched to science. Unfortunately, the science lectures at Kiev were also monotonous and at age 19 he added science to the growing list of subjects he had dumped! He now decided that he owed it to the world to become a musical maestro! He gave up life in Kiev and moved to the capital of the Russian Empire, Saint Petersburg, to study piano at the Imperial Conservatoire of Music. At age 21, as you’ve probably guessed by now, he decided music was a bit of a bore (he actually had significant musical talent, but he was not a maestro) and maybe science would be the most interesting field for his mercurial mind. He enrolled at the University of Saint Petersburg, and there, for the first time, he encountered talented scientists. And now there was no going back. He discovered that science was his true vocation, particularly botany and microbiology – he found the microbiological work of Louis Pasteur in France especially interesting and inspiring. In 1881, age 24, he graduated with a science degree, then began post-graduate work investigating the effects of nutrients on yeast growth. In 1884 he obtained a masters degree in botany. Winogradsky’s reputation as a promising scientist reached the ears of Heinrich Anton de Bary, a microbiologist and the founder of modern mycology (the study of fungi). De Bary engaged Winogradsky in 1885 as a research worker at the University of Strasbourg, which was then in Germany, but is now in France. De Bary suggested to Winogradsky that he could study Beggiatoa, a puzzling bacterial organism. Beggiatoa was puzzling because it did not grow in the nutrient mixtures normally used in laboratories, yet in sulfurous spring waters it could develop into huge colonies, forming large mats. Winogradsky traveled to a number of different springs to personally collect samples of water, which he brought back to the laboratory. Beggiatoa mats growing around a hydrogen sulfide rich cold vent in the Gulf of Mexico. Image courtesy of Expedition to the Deep Slope. 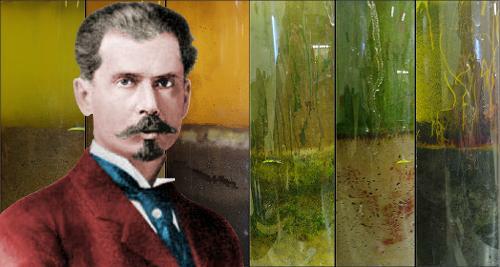 By 1887, the 31 year old Winogradsky had discovered that Beggiatoa did not obtain energy by any previously known method. Beggiatoa’s energy came from a chemical reaction between hydrogen sulfide, present in sulfurous waters, and oxygen. The reaction also produced sulfur and water. Beggiatoa stored the sulfur it produced within its own cells and, if needed, could react this sulfur with oxygen to produce even more energy. It was the first time anyone had discovered a living organism that survived using inorganic compounds/minerals as a source of energy. This type of organism is now called a lithotroph. Winogradsky also observed that the bacteria only functioned when carbon dioxide was present – this was to prove important. Having made this tremendous discovery, Winogradsky had to move on, because, in January 1888, de Bary died. During his time in Strasbourg, Winogradsky invented the Winogradsky Column, which is still used today to learn which communities of bacteria are present in a sample. It consists of a glass cylinder half-filled with mud from a river or lake, topped up with water. A number of ingredients, such as sodium sulfate, calcium carbonate, and cellulose (newspaper) are added to provide sources of nutrition for bacteria. Within the column, scientists can control the amount of nutrients and light available to bacteria. 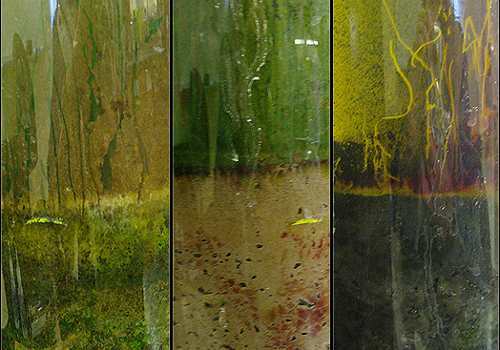 The mud-water boundaries and the communities of microorganisms growing in three separate Winogradsky columns. In 1888, Winogradsky moved from Strasbourg to the Swiss Polytechnic Institute in Zurich, Switzerland; there he began studying bacteria involved in nitrogen fixing. It had already been established by Martinus Beijerinck in Holland that bacteria growing in nodules on the roots of pea plants were able to fix nitrogen – in other words bacteria could convert airborne nitrogen into water-soluble nitrates required by green plants. During three years in Zurich, Winogradsky discovered three entirely new genera of nitrogen fixing bacteria. He also provided chemical proof of two separate steps in nitrogen fixing: firstly, the oxidation of ammonium to form nitrite, then the oxidation of nitrite to form nitrate. And he made his greatest discovery: chemosynthesis. From his years in Strasbourg, Winogradsky suspected that Beggiatoa bacteria used energy from hydrogen sulfide reacting with oxygen to process carbon dioxide into the molecules of life, but his experiments had not provided proof of this. Now, working with nitrogen fixing bacteria, he was able to prove that carbon dioxide was taken in by the bacteria and used as the source of carbon in the bacteria’s cells. Most of us are familiar with photosynthesis – the process in which organisms use light as the energy source to build organic matter – the molecules of carbon-based life – from carbon dioxide and water. Winogradsky discovered an entirely new process – chemosynthesis – in which organisms use chemical reactions rather than light as the energy source to build organic matter. In the case of Beggiatoa, the energy is produced by the reaction of hydrogen sulfide with oxygen. In the case of nitrogen fixing bacteria, the energy is produced by the oxidation of nitrogen and its compounds. We now know a great many organisms on our planet survive by chemosynthesis. A number of these are extremophiles, carving out a living in extreme conditions – for example very high temperatures or high acidity, where other organisms cannot survive. Planetary scientists speculate that extremophile organisms using chemosynthesis might exist on Jupiter’s moons Europa and Callisto and possibly below the surface of Mars. Giant tube worms on the ocean floor. These organisms live over a mile deep near vents that push out water rich in hydrogen sulfide. There is no light for photosynthesis at these depths. These worms have no guts; instead they have an organ containing chemosynthetic bacteria that react hydrogen sulfide with carbon dioxide to produce organic compounds, which are used to nourish the worms. The bacteria also produce energy – no sunlight required. Image courtesy 2011 NOAA Galapagos Rift Expedition. By 1890, Winogradsky’s name had become well-known and respected. He had discovered something remarkable – that inorganic molecules could be transformed into organic molecules with no need for photosynthesis. 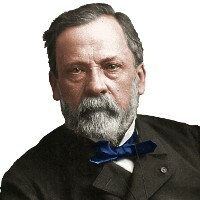 Louis Pasteur, Winogradsky’s scientific hero, invited him to become head of microbiology at the Pasteur Institute in Paris. His hero, Louis Pasteur, was captivated by Winogradsky’s discovery and invited him to move to Paris to become Head of Microbiology at the Pasteur Institute. It was a mouth-watering offer, which Winogradsky would have loved to accept, except he was feeling rather homesick. He decided it was time to return to his homeland, moving to Saint Petersburg as Head of Microbiology at the Institute of Experimental Medicine. Clostridium pasteurianum was a significant discovery – it was a microorganism living in soil that took nitrogen from the air and fixed it in the soil, making it available to plants. C. pasteurianum increased the soil’s nitrogen content even if no plants associated with nitrogen fixing, such as peas, were present. In 1902, Winogradsky became director of the Institute of Experimental Medicine and was appointed editor of Archives of Biological Sciences, a journal in Russian and French that became one of Russia’s most important science journals. Winogradsky continuted as the Institute’s director until 1905, when he was 49 years old. He did not enjoy the administrative work and resigned in order to return to scientific research. However, Saint Petersburg’s cold winters were causing his health to fail. In 1910, aged 54, he retired to spend most of each year at his family’s estates in the Ukraine and winters in his holiday home on Lake Geneva in Switzerland. The Russian revolution, which began in 1917, was bad news for wealthy landowners and in 1921 Winogradsky left his homeland permanently. He worked in Belgrade, Serbia for a year. In 1922, he was invited once again to join the Pasteur Institute. And so the 66-year-old Winogradsky finally moved to the Pasteur Institute, perhaps regretting he had not done so when Louis Pasteur, now deceased, had personally invited him to join over 30 years previously. He worked at the Institute’s laboratory in the village of Brie-Comte-Robert. Winogradsky began work in France at an age when most people think they ought to have retired. He concerned himself with the science of microbial ecology, which he founded. His research looked holistically at the interactions of microbes with their natural environment, increasing our knowledge of the nitrogen cycle and the sulfur cycle. He also researched iron bacteria, nitrogen fixation by Azotobacter, and cellulose-decomposing bacteria. Winogradsky married Zinaida Alexandrovna Tikhotskaya in 1879, when he was 23 years old. The couple remained married until she died in 1939. The marriage produced four daughters, of whom two, Katherine and Helen, moved to France with their parents. Helen worked as a microbiologist at the Pasteur Institute with her father. Although in his twenties he had abandoned his efforts to become a serious musician, Winogradsky loved to relax playing the piano. He enjoyed an unusually long and active life. He was 93 years old when he completed a 900 page book: Soil Microbiology: Problems and Methods, Fifty Years of Investigations. Sergei Winogradsky died in his sleep at the age of 96 in Brie-Comte-Robert, France, on February 25, 1953. "Sergei Winogradsky." Famous Scientists. famousscientists.org. 14 Jun. 2015. Web. Sergei Winogradsky: A founder of modern microbiology and the first microbial ecologist.